Betting on a CureSupport our mission through a night of dinner, cocktails, horse races and fun. 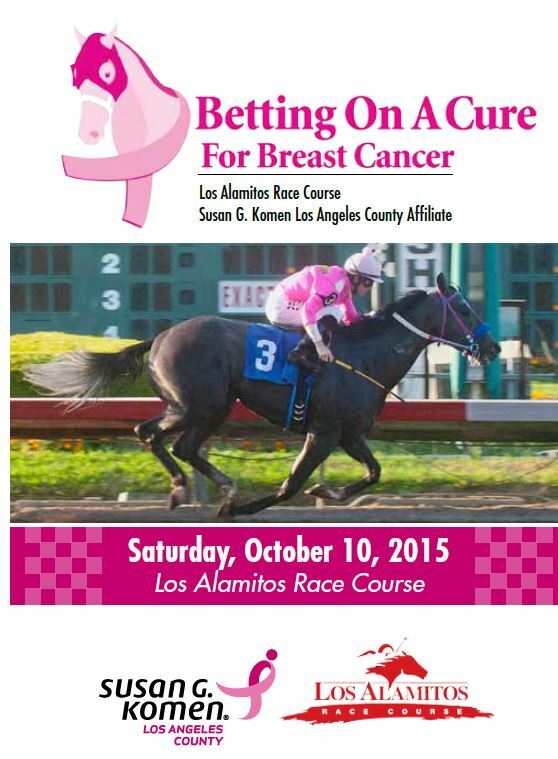 We are honored and excited to invite you to participate in Betting on a Cure at the Los Alamitos Race Course, Saturday, October 10. Tickets are available for purchase now. It will truly be a night to remember with quarter horse and thoroughbred racing under the stars. There will be a highlighted pink ribbon race as the centerpiece of the evening topped off with a wine reception and dinner. The first race will start at 6PM and the hosted wine reception will start at 6:30PM. A delicious dinner will be served at the Los Alamitos Vessels Club. Event attendees can purchase $10 raffle tickets which enter you to win WSS Shoes, a complimentary two-night stay at the Ritz Carlton Marina Del Rey or one of a kind jewelry from Diamond International. Each one of our patrons becomes a partner in our mission and plays a vital role in the local fight against breast cancer. Your support and contributions will help us reach women, men and their families, and enable us to provide the medically underserved and uninsured in Los Angeles County with crucial breast health services.